The Move Ascension Initiative is a multimillion-dollar transportation program developed to improve road safety and traffic congestion in Ascension Parish. The program is designed to work in collaboration with the ongoing state highway improvements to provide safety and capacity upgrades for parish corridors that see high usage. The Move Ascension Initiative is being delivered with no additional cost to taxpayers. In 2017, Ascension Parish budgeted $35 million of local tax dollars to the program, including proceeds from a newly authorized bond issue and Road Construction funds. In 2018, the Transportation Department identified and vetted an additional $30mm of funding to add to the Move Ascension Initiative budget. This additional funding has been allocated to Ascension Parish through State/Federal Safety grants, Road Transfer Program funds, CRPC grant funding and Transportation Impact Fee money. These additional funds in addition to yearly allocated Road Construction funds are essential in order to fund all of the current MA projects through to construction that are identified on this website. This web site was developed completely in-house by the Ascension Parish Office of Technology. All Aerial Imagery is provided by the Ascension Parish Video Programming Department. Project data is provided by the Transportation Department and is updated periodically. Click BELOW for a map of all current projects. The Move Ascension Initiative is a multi-million dollar transportation infrastructure improvement program developed to safely move traffic within Ascension Parish. During the Master Transportation Planning Development phase, a list of Quick Start projects was identified and further separated into two phases. The Quick Start Projects, dubbed the Immediate Action Projects (IAP), were identified and further prioritized with the help of Ascension Parish’s Program Management Consultant. On August 17th, 2017 Ascension Parish President Kenny Matassa requested Parish Council approval to move forward with all pre-construction activities associated with Quick Start – Immediate Action Projects. On September 7, 2017, the first design task order was issued to begin work on the first of the Immediate Action Projects with a pre-construction deadline of December 2018. It is the goal of this administration to start construction activities on the IAPs by the first quarter of 2019. 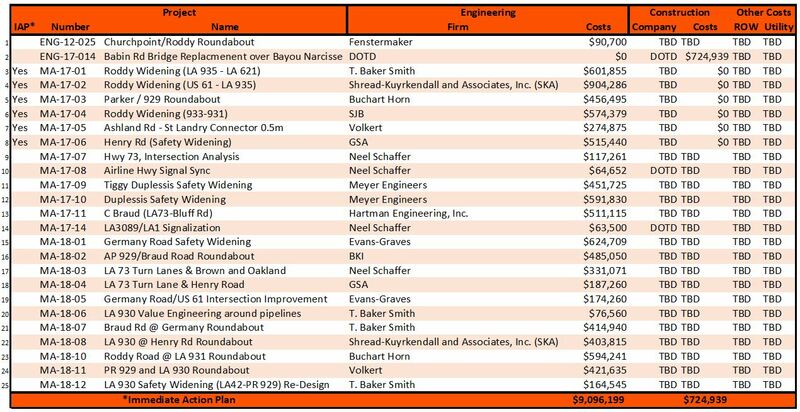 The Transportation Department has issued design task orders for 18 projects that are funded through to construction. Please view the Projects page to view all MA projects in addition to task orders issued for traffic flow improvements.